We’ve received Angie’s List Super Service Awards for both plumbing and drain cleaning every year consecutively, going back to 2007, as well as the Best Plumber award from Best of Bethesda. Our company is fully licensed, bonded, and insured. We offer friendly, courteous service with fast response times, and we accept all major credit cards, for your convenience. Both Joe and Billy have Master Plumber and Gas Fitter licenses and more than 40 years of specialized experience. 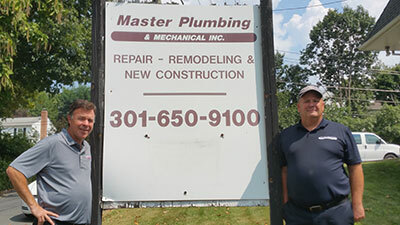 Joe and Billy are active participants in the plumbing trade’s development, serving as past presidents of the Washington Suburban Master Plumbers Association (WSMPA). Billy previously served over 10 years on the WSMPA board, while Joe is in his sixth year on the board. We insist upon stringent application of current plumbing codes and standards, regardless of the size of a job. Our technicians are professionally trained and experienced in every aspect of the plumbing trade and pay meticulous attention to detail on every job we perform. Beyond our technical capabilities, we pride ourselves on honesty, integrity, and courtesy in sales and service. Our business has been built on the goodwill and references of our customers, so your ongoing satisfaction with the work we perform is key to our growth as a company. We look forward to serving you.